North Carolina Gov. Bev Perdue talks about suspending elections. Is she serious? Would members of Congress be more productive and more bipartisan if they weren't concerned about re-election every two years? It's a thought that's crossed the minds of many voters as well as House members, many of whom have complained over the years about non-stop campaigning. But Bev Perdue, the Democratic governor of North Carolina, said it out loud Tuesday. "I think we ought to suspend, perhaps, elections for Congress for two years and just tell them we won't hold it against them, whatever decisions they make, to just let them help this country recover," Perdue said. She later added, "You want people who don't worry about the next election." Was she kidding? "It's unclear whether Perdue, a Democrat, is serious -- but her tone was level and she asked others to support her on the idea," the first report on Perdue's remarks, in Raleigh's News & Observer, concluded. You can listen to Perdue's complete comments at The News & Observer. 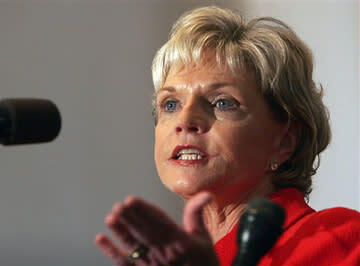 "Not only does this bizarre commentary suggest ignoring the Constitution, but does Governor Perdue forget her own inability to work with the Legislature, regardless if controlled by Democrats or Republicans?" Pat McCrory, Perdue's presumed Republican opponent in 2012, wrote on his Facebook page. Perdue's office said the governor wasn't making a serious proposal. "Come on," her spokeswoman Chris Mackey said in a widely-reported statement. "Gov. Perdue was obviously using hyperbole to highlight what we can all agree is a serious problem: Washington politicians who focus on their own election instead of what's best for the people they serve."